Shortly after giving birth, a common thought among my clients (and me, as well as just about every woman I’ve ever talked with about the subject!) is, what the hell just happened to my body?! We all seem to have this misconception that once we give birth and we’re past that initial postnatal period that our body will just slowly go back to how it was before we were pregnant. Needless to say, it’s a huge shock when that doesn’t happen. Not to mention, it can cause anyone to go into a tailspin of anxiety and depression as they try to regain their sense of self with a brand new role as a mama. I don’t think this misguided thought is totally our fault though. During the prenatal period, everyone is really helpful in letting you know what to expect in your changing body. No one really mentions what to expect of your body after baby arrives. Sure, you get that one postpartum appointment, but that always seems to be way more like a check-in than an explanation of what to expect during those initial months post-birth. Plus, often if you ask your practitioner about things that pertain to regaining your core strength (posture, balance, or asking why the hell you feel like there’s a gaping hole where your abdominal muscles used to be), you’re met with little information or (sometimes far worse) incorrect information. It’s not completely the fault of our practitioners though—they usually don’t learn this information as part of their training. So, mama, I’m here to tell you that you aren’t alone! Many women have diastasis recti or other common issues that limit core function after pregnancy. Hopefully, that helps you to feel a little better about your situation, but I’m sure you’re still wondering—what the *eff* is diastasis recti and what can I do about it? Simply put, diastasis recti is a separation of the rectus abdominals—the outer layer that creates that six-pack look we’ve all come to crave. 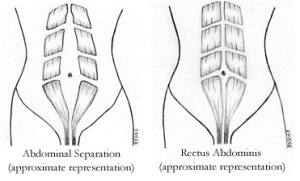 The two sides of the rectus abdominal muscles are held together by a thin layer of connective tissue called the linea alba. This connective tissue stretches during pregnancy to accommodate for your growing baby. That stretching can cause the connective tissue to tear or loose its elasticity. What makes this a bit more complicated is that the belly pooch that you may be experiencing as a result of the gap in the rectus abdominals is usually not simply caused by the gap. It’s usually caused by intra-abdominal pressure and poor postural compensations. These happen during pregnancy as a result of your body structure shifting to accommodate for your growing baby. You may notice that your ribs thrust forward, you walk with most of your weight in your heels, or your lower back is excessively arched—these are postural compensations that often occur as a result of pregnancy and they don’t always go away on their own. So what can you do about it? Let’s start with what you shouldn’t be doing. Basically any movement of the body where a visible dome-shape appears in the abdomen is placing pressure on the linea alba. In order to start feeling symptom relief, the first things you should START doing are core exercises that focus on strengthening the transverse abdominal (deep layer) muscles, reintegrating the connection between the core and pelvic floor muscles, and that don’t place added pressure on the abdomen. The transverse abdominals run laterally across the abdomen like a corset. It sits behind the rectus abdominals and the oblique muscles. This muscle cinches the waist and internal organs in towards the midline of your body and also aids in the respiratory process. The transverse is stretched during pregnancy and is a huge contributing factor as to why you still have that belly pooch months (or even years) after giving birth! Once you begin to feel that connection to your deep core muscles again, these exercises can be built upon to continue to strengthen the core and pelvic floor. Keep in mind, the core doesn’t function in isolation! An exercise program should also focus on strengthening the entire body to regain postural control and balance. A strong core and pelvic floor will improve postural compensations caused by pregnancy, strengthen and tighten the belly, and improve incontinence and diastasis recti issues. Need some help learning how to perform the exercises above or want to test for diastasis recti? Check out the Y2B Fit YouTube page for some FREE video tutorials. If you’re looking for a more comprehensive program, we offer a Core Restore Series both in-person in our Philadelphia, PA studio as well as Live Online via our virtual studio or email Crystal for more information.